Extra and Extra High are two new gravity bed filters for coolants. Extra High has a double system of coolant discharge which grants more flowrates in a little space. The inclined bed system reduces the filtration media consumption, while the proximity sensors allows a precise movement of fabric. Filtration systems of Extra series are supplied with a rewinding system to facilitate the changing operations. 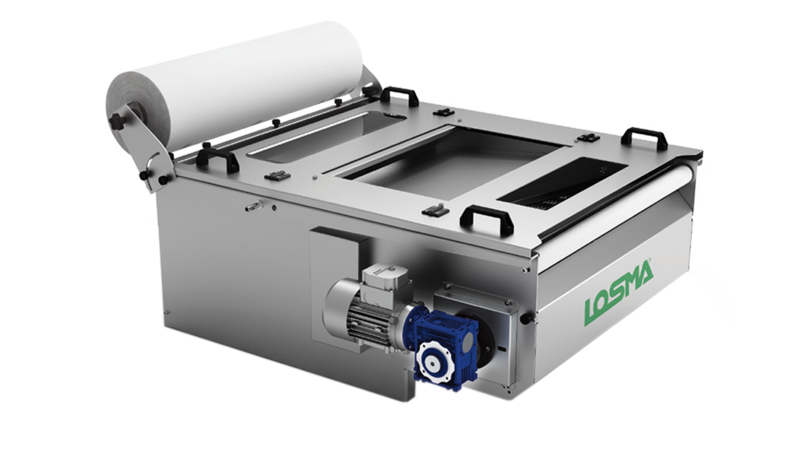 Extra is available in two versions, normal and with augmented depth, with 11 models for throughput from 50 to 300 l/min for neat oils and from 100 to 600 l/min for emulsion. Filtration degree is set thanks to the tissue choice and varies from 10 to 50 microns. Extra High is also supplied with a hydraulic guard, a double system of spill doors on the sides, to avoid overflow phenomena caused by a wrong working of the dragging system. 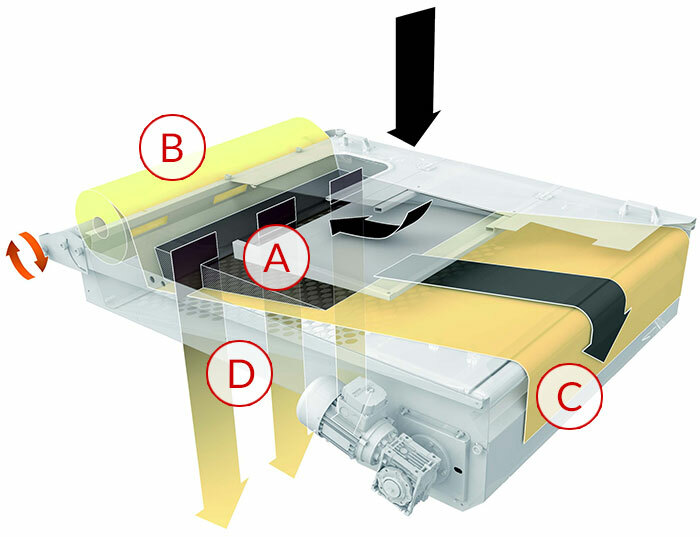 Contaminated coolant is piped into the trough (A) and distributed on the filtration fabric (B),retaining pollutant particles and allowing the cleaned to pass. The fabric collects pollutant particles until it is full and the coolant cannot cross it anymore. The coolant rises its level touching a float which actions the proximity sensor controlling the fabric movement and the replacing with the new one. 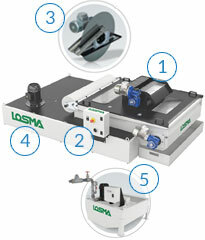 Dirty fabric (C) is rewound with a dedicated system, while sludge are separated from a scraping blade. 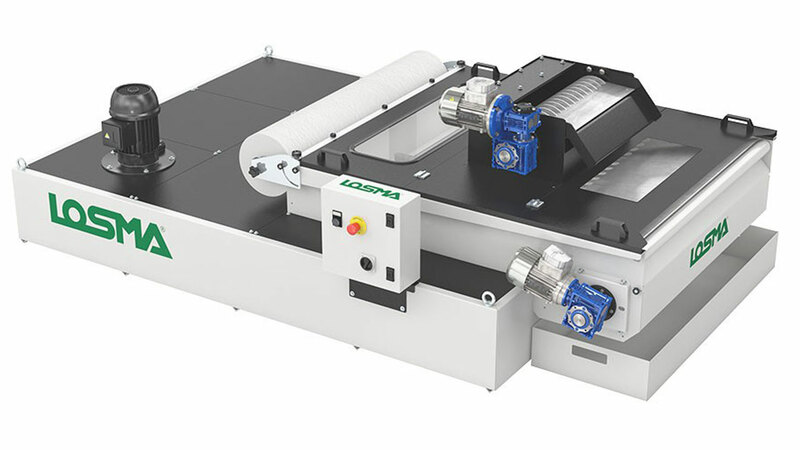 The clean liquid pass in the thank below (D) and is sent back to the machine tools thanks to the dedicated system, while sludge are separated from a scraping blade.